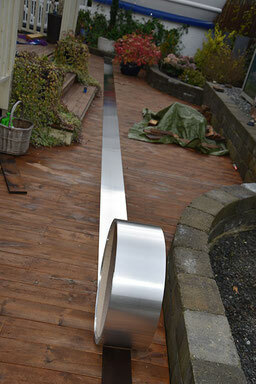 Aluminum roll, one millimeter thick. Fastened with masonry screws, this forms a barrier to rain and drafts under the base of the dome. 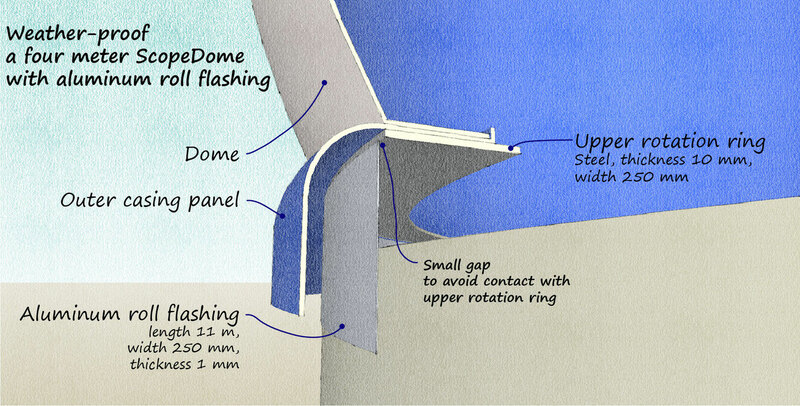 To minimize drafts and humidity when the dome is closed, the ScopeDome manual recommends capping the top of the crown with a ring of sheet metal that extends horizontally to the lower dome casing. This closes the gap between the crown and dome casing, and forms a horizontal barrier that blocks wind and rain from entering the dome through the open space between the rotation rings. An astronomer who owns a four meter ScopeDome suggested a simpler weather-proofing alternative that does not require cutting an annulus. One can instead use an eleven meter strip of metal or other water-tight material in order to form a vertical barrier. I obtained forty meters of 25 cm wide, 1 mm thick aluminum roll as offcut from a local aluminum foundry. Illustration showing aluminum roll flashing used to weatherproof a four meter ScopeDome. The drawing shows how the aluminum roll flashing extends above the observatory crown. Provided the outer diameter of the observatory crown is the same or slightly larger than the diameter of the rotation ring, the flashing forms a tight fit. However, the flashing must not contact the upper rotation ring. The inner casing is not shown in this illustration. 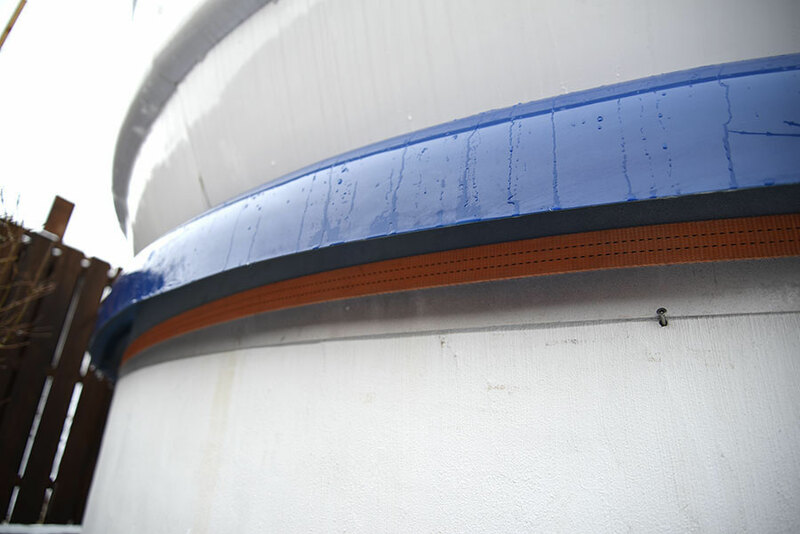 The inner casing forms an additional weather barrier. With these two barriers in place, the four meter ScopeDome weather tight. Photograph of the outer dome casing and aluminum roll flashing. The latter is first mounted temporarily by cargo straps, and adjusted so that it just clears the upper rotation ring. The photograph to the right shows the aluminum roll flashing held temporarily in place by a cargo strap. This holds the flashing securely while allowing vertical adjustments. The flashing must just clear the upper rotation ring by a millimeter or two. The flashing is later fastened permanently using masonry screws.